Spring has arrived (the crocuses are up! ), but tinges of winter remain with mounds of snow slowly eroding in the shady spots. In the middle of March we had a snow storm that dropped several additional inches of snow onto our already big piles. See our Buddhas covered in snow. The quiet helped to keep our minds in retreat, whereas the sunny (but chilly) spring weather made us eager to get outdoors. Now that we’ve completed all the beautiful ceremonies that ended our winter retreats, the Abbey doors are open. Please come visit. Lots of opportunities for sharing the Dharma are coming right up. If you have visited the Abbey, you know that as you come up the S curve on Country Lane, the patch of forest on the left side of the road was badly overgrown—clogged with fallen trees and dead standing ones that crowded out the healthy trees. The whole area was a fire ready to happen. 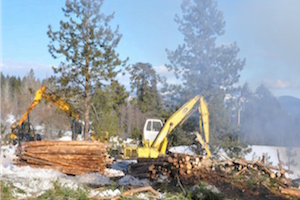 In March we hired some loggers to come in and clean the area up. Watching the logging machines take down the big trees was fascinating. The arrival of the logging machinery coincided with the discussion of definienda, definitions, and illustrations in our Thursday evening class on debate and Collected Topics. One monastic made a quiz for us where we matched the definienda of feller-buncher, loader, skidder, and processor with the pictures of the equipment and their descriptions. It was funny, but pertinent, as we all learned some logging vocabulary. 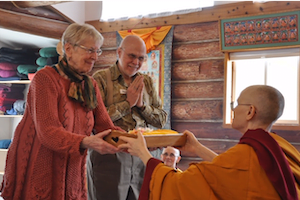 Our three-month Vajrasattva retreat ended in the same week as our annual Varsa retreat (see below), so ceremony followed ceremony over several days. 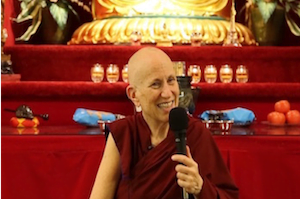 As we gradually came out of silence and began to share our experiences, it was clear that everyone had used the time well, focusing intently to transform our minds in deep Dharma practice. See the photos of retreat life. In the final go-around circle, person after person spoke of seeing how we bring on suffering by trying to squeeze happiness from sources that can’t possibly give us what we want. While sobering, this realization also brings lots of joy as we gain clarity and conviction about what makes life meaningful. Read about Caryl’s journey with Vajrasattva, and Christina’s reflections on “Why We Sit” in retreat. We ended with a powerful Dorje Khadro fire puja to completely cleanse all remaining negativities, then celebrated with a beautiful Guru Puja in the afternoon following the Kathina ceremony. We especially dedicated the merit for the 267 folks who did the Retreat from Afar and all Abbey supporters. The Abbey community expressed our gratitude in the form of simple gifts to the lay volunteers, retreatants, and all the people who came to help rejoice in the retreat. 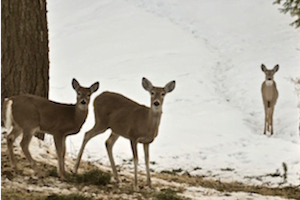 The next day, the group enjoyed a sponsored lunch and a chilly hike before our guest retreatants began to disperse. See the end-of-retreat photos. 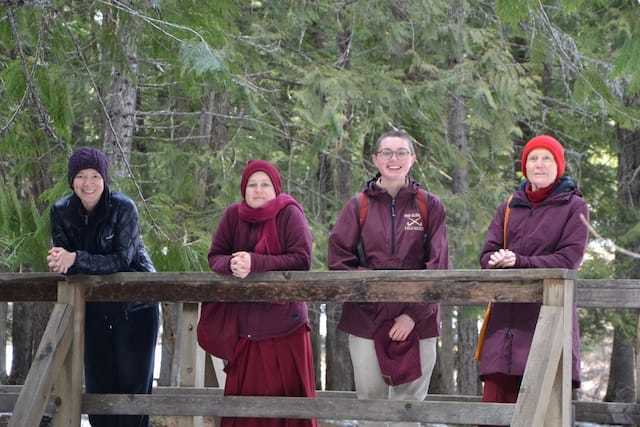 Following in the footsteps of the Buddha, the Abbey community finished our 6th Varsa—our annual monastic “snows retreat”—with two beautiful and ancient ceremonies: the Pravarana and Kathina. These end-of-Varsa ceremonies are different from the rituals that end our winter meditation retreat. At the Abbey, the monastic Varsa retreat runs parallel to, but is distinct from, the winter meditation retreat. Harmony is paramount during the three-month Varsa period. At the end, we do the Pravarana ceremony, an invitation for others to give feedback on our behavior during Varsa. It’s a wonderful practice of introspection, transparency, humility, and learning. We’ve found that the guidelines for Varsa and the concluding Pravarana contribute to maintaining community harmony throughout the year. This year, all resident and guest monastics gathered in a circle before the actual rite to iron out any misunderstandings from the previous three months. There were few, and we were able to give our Pravarana with confidence and receptivity. The Kathina ceremony, which follows Varsa, highlights the interdependent relationship of ordained monastics and lay followers. Originally, it was a time for offering robes to the sangha. These days, Kathina offerings of all types help to replenish monastery supplies after the long winter retreat. 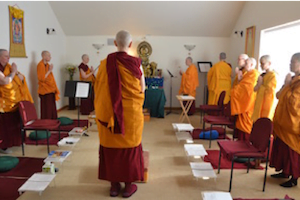 Over 30 guests joined the nearly 20 residents and retreatants for this year’s Kathina, which we celebrated on the same day as our annual end-of-retreat Lama Chopa Puja. It began with a long procession of junior monastics and lay supporters making their way to the Meditation Hall, where the fully ordained nuns waited to begin the ceremony. 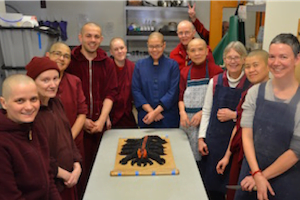 Bill and Marianne Miller represented Abbey lay friends worldwide when they ceremonially offered the “robe of merit” to the sangha, which the sangha then offered to Ven. Samten as the “robe keeper” for this year. The chanting was joyful as monks, nuns, and lay people invited the presence of all the Buddhas and bodhisattvas. It was a beautiful day. Whenever we do these ancient rites, we have a sense of the millions of practitioners who have come before us, keeping the Dharma treasure alive for future generations. We rejoice in the merit accumulated by all and dedicate it to the benefit of all sentient beings. Ven. 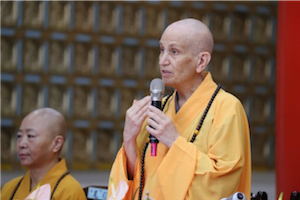 Chodron was invited to participate as a witness in the bhikshuni ordination at Fu En Si Buddhist temple in Taiping, Taiwan. This was a great honor and gave her the opportunity to observe and learn the details of this complex sangha procedure. Ven. Damcho accompanied as her translator. Enroute they stopped at American Evergreen Buddhist Association where Ven. Chodron gave a talk on “Samsāra, Nirvāna, and Buddha Nature,” focusing on how liberation and omniscience are possible. Watch the talk here. Arriving in Taipei they stayed at Pu Yi Nunnery, where they met with the Abbess, Ven. Zhao Yin, and Ven. Hengching, a Chinese bhiksuni who is a retired professor of Buddhism. Since the Abbey will be planning a new Buddha Hall this year, a good part of the discussion was about how Pu Yi designed their Buddha Hall. Ven. Chodron also gave a talk to the Pu Yi nuns on how to meditate on Amitabha and integrate the Pure Land practice into daily life. The Abbey nuns then headed for Fu En Si Buddhist temple, where 41 monks and 89 nuns were preparing to receive the full ordination, including Abbey resident Ven. Tsepal. The program is intense with daily teaching and training sessions and little free time. One highlight for Vens. Chodron and Damcho was the opportunity to take their meals with the senior nuns and monks who are the training guides. They had fascinating discussions and got a behind-the-scenes view of what happens at an ordination platform. The camaraderie among the monks and nuns who were guides, as well as their compassion and dedication, were wonderful to witness. The lay volunteers were also incredibly kind and supportive, as the Abbey monastics who have received the full ordination in Taiwan know. The organizers asked Ven. Damcho to translate as there are about eight candidates who need English translation and there was no other translator to help them. 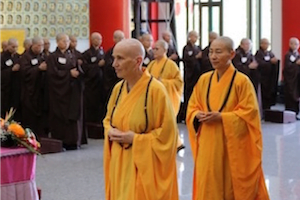 Therefore, after accompanying Ven.Chodron on a short teaching trip to Hong Kong, she will return for the final weeks of the ordination training. Her excellent translations have been greatly appreciated by the English speakers! When Vens. Chodron and Damcho learned that Ganden Tripa Rinpoche was teaching in Taiwan, they went to visit him. He was pleased to hear about the Abbey’s activities and development. They also had private appointments with several of the bhikshu and bhikshuni preceptors where they asked Dharma questions and discussed other Dharma issues. Photos of the Taiwan visit are here. Ven. 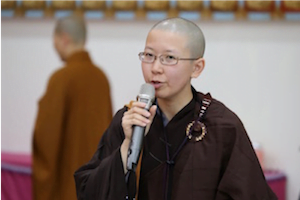 Chodron shares a first-person account of being a bhikshuni witness for the ordination at Fu En Si Temple. The ordination lasted two days due to the number of people receiving the full ordination. The first day we blessed the platform where the ordination would occur by bowing and chanting beautiful verses, offering flowers and incense to the Buddhas and bodhisattvas, and inviting them to the place. This was a dual ordination for the nuns, which meant that they were ordained first by the bhikshuni (fully ordained nuns) sangha and then by the bhikshu (fully ordained monks) sangha with the bhikshuni sangha also present. The ordinees came in groups of threes, so it was quite a lengthy, but joyful, process to ordain all of them. The steps of the ordination process are intricate, and most of then nuns had been training at their home monasteries as well as at the program to learn them. They were nervous and excited, and I heard that after exiting the room where the ordination occurred, many shed tears of joy. Since I was one of several bhikshuni witnesses, we alternated being present at the various ceremonies. I participated in blessing the platform and in the evening when the first groups of nuns were ordained by the bhikshu sangha. (They had been ordained by the bhikshuni sangha that afternoon.) At the end, we stepped out into the cool evening air and the preceptors and witnesses said auspicious verses. I had the chance to congratulate the new bhikshunis too, and my heart was filled with joy at seeing their virtuous aspirations and their dedication to the Dharma and to practicing bodhicitta. The second day, I was one of the witnesses for both parts of the ordination and was there when Ven. Tsepal’s group was ordained. She, and all the others, were so happy afterwards. There were a number of other events around the ordination, including a banquet lunch for all the preceptors and witnesses (held in the Buddha Hall). I was invited to give a short talk on the day before the ordination when the witnesses were introduced. Several nuns approached me afterwards and said that what I said made them cry (in a good way). They’re so sweet—full of enthusiasm for the Dharma. I was also asked to speak to the newly ordained monks and nuns the day after the ordination. I felt privileged to be able to share with them some of what I’ve learned in my 42 years of ordained life, to give them some tips on handling difficulties, and to encourage them in generating bodhicitta. If you live in the United States and made an offering last year, your copy of the 2018 Annual Report should have already arrived in your mail box. A modified version is now on the web. Please take a look and rejoice in all the joyous effort from Abbey residents, visitors, volunteers, benefactors, and friends to create peace in a chaotic world. 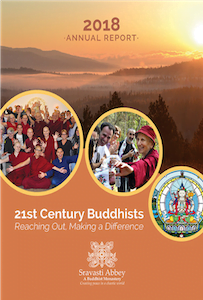 “His Holiness the Dalai Lama advises us to become 21st Century Buddhists. He wants us to be well educated in the Dharma and to use reasoning to examine the Buddha’s teachings and to practice them, not out of blind faith, but with informed conviction. Read more in this post, or download the web version of the annual report here. Please note that we no longer post financial information and benefactor names on the website. To see the 2018 financial report and list of donors, write the office. 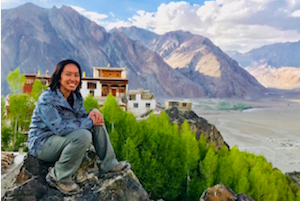 Abbey friend Dr. Belinda Escanio went to Zanskar last year on a medical mission with Hands on Global. A remote mountainous region in northern India, Zanskar is culturally Tibetan. His Holiness the Dalai Lama was a guiding force in building the hospital that Dr. Belinda will return to this summer. The mission is looking for volunteer care providers to join them June 3 to July 4. They welcome doctors, NPs, PAs, nurses, physical therapists, and massage therapists. Optometrists are especially needed. Watch this inspiring video about the project and contact Dr. Belinda Escanio to learn more and volunteer.